groov EPIC Security Series, Part 2: What's a Firewall? Ever notice how emergency exits in a building open outward? Then, to keep the building secure, they are usually locked from the outside. You can get out easily enough, but you can’t get in that way. However, on a building’s main front entrance, the door often swings in so you can enter. Typically, there is a security guard or perhaps a receptionist there to check your ID and keep an eye on the comings and goings. Trusted and untrusted: when it comes to people, it can be hard to know someone at first pass. You need some time to build a picture of the person. When it comes to networking, it’s a little more cut and dried. You either know who’s on a network or you don’t. Can it really be that simple? Is there really a way on a groov EPIC to keep those you don’t trust away from those you do? Let’s take a quick look at the topic of sinking and sourcing outputs. Where did the difference come from, and where does it matter in automation? Quick answer: you often have to choose the correct module because the device you are wiring requires either a sink or source. For example, if you have a prebuilt electrical cabinet, it may be wired using a common positive or a common negative method. Thus you HAVE to choose the correct digital output module for the way the panel is wired. The Case for Intelligent I/O Systems. The automation PC is located in the control room, and the dump valve is on the other side of the tank farm wired to a remote I/O cabinet, all connected over an Ethernet network. That answer might be sufficient for watching YouTube, but it is just not going to cut it for controlling that valve. In last week’s blog we covered how to set the real time clock (RTC) in a PAC Controller with an accurate time server over the Internet using SNTP. Now that our controller knows exactly what time it is, how do we turn on that pump at 6:00 a.m. on the dot? Like most aspects of programming, there are a few different ways to achieve the same result, so join me in this week’s blog while we look at one way to manage real-time scheduling. Do you know what time it is? Does your SNAP PAC controller know what time it is? Are they the same time? Who’s right? In this week's blog we are going to talk about this big ball of wibbly wobbly timey wimey stuff.… No, not time travel, but actual time…. Specifically how to set your PAC Controller to the current time. No reading ahead; remember, time flies like an arrow and fruit flies like a banana. More information in less space. It is amazing how sometimes similar applications can come back to back….Last week's blog came from a customer asking how to measure the main power grid frequency. And later the same week I had a totally different customer ask me about how he could display upper, lower and current value of the main electrical grid frequency in groov. What are the chances of that!!?? This customer wanted one gadget to display all three values. Why so dense? Because they only use groov on smart phones, no PCs or Tablets. He was polling the data from a bank of UPSes and so needed to display a lot of data. Screen real estate is prime on those devices. What can we do to help? In this week's blog, we are going to have some adventures in Z-Order. 50 or 60 Hertz - Roughly. Measure the main power grid frequency, he said. It will be fun, he said…. Actually, pretty sure I said something like, “it will be easy”... and I was mostly right, and best of all, it did turn out to be fun! It seemed like both a reasonable and easy request. The requirements were to measure the mains power grid frequency to a resolution of 0.01 Hertz, and to do it every 125 milliseconds (roughly; it could be a max of 200 milliseconds, but not much longer). Why? In this case, the chase is better than the catch. It's enough to say the customer had his reasons, and this blog is about the chase. PID loops are used in a lot of different applications, and for good reason: they help keep our world under control. If you need to control a process temperature or pressure, you probably are going to use a PID loop. But are they always the right solution? Ultra quick review; a proportional-integral-derivative control loop (or PID controller) compares a setpoint against a measured input value, and depending on the error, changes a control variable (output). It’s all about math. 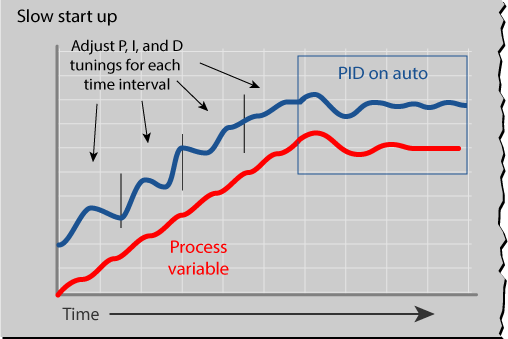 A PID loop is all about running a mathematical formula over and over at a specific rate. The most common example of a PID loop that I often talk about in our monthly training class is the cruise control on a car. The speed of the car is the input, the accelerator is the output and the setpoint is what speed the car is doing the moment the driver presses the “set” button. PID loops are so useful that sometimes we too quickly decide to use a one in a process when it may not be the best solution to the problem. In this week’s blog we are going to take a look at one instance where use of a PID loop may not be the best tool for the job. From a young age I have been looking up at night. Not sure exactly when I fell in love with astronomy, but I can recall looking up at the stars every chance I got as a kid. I have ebbed and flowed with the amount of time and equipment I have had to spend on the hobby. In Australia I had a fully enclosed fiberglass domed observatory, which I chose to not ship over when my family moved to The States, but the desire to look up has not gone away. Only the constellations at the horizon can be seen in both hemispheres, and even those look upside down compared to what I used to see. So I wanted to get something up and running fast here that would allow me some time to get my bearings in the sky and to share my new stars with my mates back in Australia via my personal website. In this week's blog, I would like to share what astronomy tools I currently have set up, thanks to some Opto 22 hardware and groov.